It is time to recognise the power of media, individuals and corporations to promote better body confidence for all. 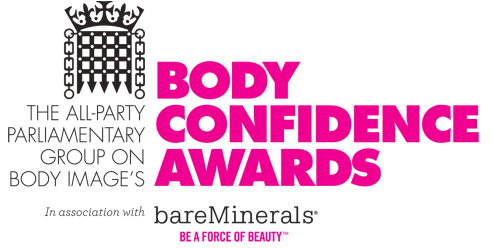 The APPG on Body Image is delighted to announce the UK’s first Body Confidence Awards presented in association with bareMinerals. Mounted by the APPG and with the support of the Campaign for Body Confidence founded in 2009, the ceremony will be held on 19 April 2012 at 7:30 PM at the House of Commons. The Awards will recognise and celebrate the achievements and best practice of those who promote body confidence within various industries. A judging panel made up of representatives from B-eat, the Centre for Appearance Research, All Walks Beyond the Catwalk, AnyBody, Stephanie Heart Enterprises, Mumsnet, and the Central YMCA along with Jo Swinson MP sifted through countless nominations to come up with the shortlists. The nominees were chosen for a number of reasons including aspirational diversity in size, age and skin tone; responsible use of body imagery and the consideration of diverse body sizes, shapes and beauty; promotion of active and healthy lifestyles and less sexualised imagery. “Over the years I have been privileged to work with some of the most beautiful and shapely women in the world and it is true to say that even the most beautiful (by any standards) have moments of doubt and insecurities. I want to celebrate women and make them feel good in my clothes”. The Campaign for Body Confidence co-founded by Lynne Featherstone MP, now Government Minister for Equalities, and Jo Swinson MP brings together a range of organisations including: B-Eat, All Walks Beyond the Catwalk, Mumsnet, Central YMCA , Anybody, Stephanie Heart Enterprise and the Centre for Appearance Research. Award-winning fashion initiative All Walks Beyond the Catwalk promotes a broader range of body and beauty ideals in collaboration with designers, professional models and education professionals. The All Walks nationwide lectures and Centre of Diversity in Edinburgh explore emotionally considerate design for all. AnyBody is a non-profit organisation encouraging a change in cultural attitudes towards bodies, food and eating so that women and children of the next generation can learn to be happy in and look after their bodies. B-eat is a leading UK charity for people with eating disorders and their families. The Centre for Appearance Research is an academic research centre at the University of West England which focuses on appearance-related concerns. Central YMCA is a health charity using advocacy and education to change attitudes toward health, including body image. Mumsnet is now the UK’s busiest social network for parents, generating over 38 million page views per month and nearly 5 million visits per month. In their most recent campaign “Force of Beauty”, bareMinerals decided to eschew models that represented the elusive notion of beauty, and instead held a blind casting call for women ages 20 to 60. They did not see the women who applied until they were selected for the campaign. Instead, they asked more than 270 women to complete a questionnaire about who they were and what they were like. The company was looking for women who embodied qualities like inspiration, humility and humour. The goal was to capture women who had compelling and interesting stories to tell. With the exception of basic colour correction, the company took pains not to retouch or airbrush photographs of the women, leaving in everything that they came with on their face. They are firm believers that they have a responsibility as a beauty company to start changing the images that women see. Photo credit: Kirsten McLennan wears Alice Temperley for All Walks Beyond the Catwalk shot by Rankin Caption: All Walks Beyond the Catwalk promote broader body and beauty ideals in their campaigns.